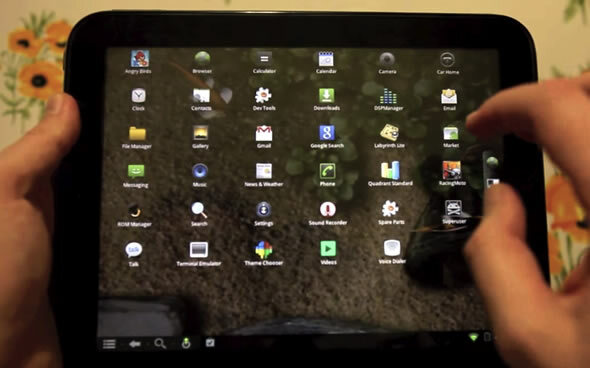 The modding society has been making progress on porting Android to the HP TouchPad. The latest success comes from the very active CM Team, which has managed to enable all important Wi-Fi connectivity (with ensuing download of Angry Birds) on the TouchPad running CyanogenMod 7 (based on Android Gingerbread). The team also managed to add accelerometer support, so the TouchPad can now switch between landscape and portrait mode (or play a game of Labyrinth) and work-in-progress audio support. We’re still a long way from a fully working port however, with the current build still lacking bluetooth, camera and gyroscope support among others. Hit the read more link below for a video showing off the goods, as it’s the only way, for now, you can experience CM7 on the TouchPad.